The Operational Coordination Centers were established at the regional and provincial level to enhance security, provide situational awareness, report and share intelligence, and coordinate operations. There are three types of OCCs - regional, provincial, and district. The Operational Coordination Center - Regional (OCC-R) is aligned with and usually located near the Afghan National Army (ANA) corps. Each province has an Operation Coordination Center - Provincial (OCC-P) usually located in the provincial capital. There are Operation Coordination Center - Districts (OCC-D) found in some of the provinces; however, this is the exception not the rule. Mission of the Operational Coordination Centers. The mission of the OCCs is to plan, integrate, synchronize, and coordinate the efforts of the Afghan National Security Forces in order to facilitate a common operational picture at the regional and provincial level. The OCCs were established in 2008 by Afghan Presidential Decree in preparation for the 2009 elections. The OCCs serve as hubs of information where the different pillars of the ANSF can share intelligence and coordinate operations in planning and in execution. Although the agencies of the Afghan National Security Forces (ANSF) all have different jurisdictions, tactics and roles - they all share the same mission of bringing security to the population of Afghanistan. Historical Examples of Operation Coordination Centers in COIN. There are many historical examples of the formation of sub-national level operation coordination centers during conflicts. During the Vietnam War the the U.S. formed District Intelligence and Operations Coordination Centers (DIOCCs) to fuse intelligence into operations. 1. In the Iraq War (the second one) similar organizations were formed to meld intelligence and operations in the fight against insurgents. Advisors for OCCs. 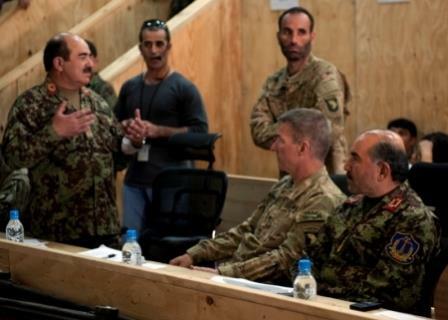 Most OCC-Rshave advisors assisting the ANSF; most recently these advisors have come in the form of Security Force Assistance Advisor Teams or SFAATs. As the Coalition forces "thinned up" at the end of 2013 and into 2014 many of these advisor teams were pulled off the provincial level OCCs. In some cases, the OCC-Ps have been deemed "independent" and they were no longer covered by advisor teams. There have been cases where the Afghans have requested that advisor teams be pulled from OCC-Ps. 4. As of 2015 most of the OCC-Rs were being advised by members of the Coalition; exceptions were in the 203rd and 215th corps areas. Operational Coordination Center - Region (OCC-R). There are six OCC-Rs across Afghanistan - usually aligned and co-located with the ANA corps. The OCC-Rs consists of personnel from the ANA, AUP, ABP, NDS, and ANCOP. Joint planning, intel fusion and sharing, integration and sychronization of resources is the principle mission of the OCC-R. These coordination centers are similiar to U.S. emergency response and coordination centers. They are designed to synchronize the efforts of all Afghan National Security Forces. Operation Coordination Center - Provincial (OCC-P). The OCC-Ps are are usually located in the provincial capital adjacent to the provincial Police Headquarters (PHQ) or governance complex. Representatives in the OCC-P include the police, army, and NDS. Sometimes the Afghan Border Police (ABP) and Afghan National Civil Order Police (ANCOP) are present as well. Operation Coordination Center - District (OCC-D). Some districts have OCCs. The district level OCCs attempt to provide a base (usually located in the district center) where intelligence can be passed and exchanged, operations coordinated, and assistance to units in contact can be provided. Typically, if an element of the ANSF gets into trouble and needs assistance they can call back to the OCC-D for help. The OCC-D, using its radios (and cell phones) can call different ANSF elements to coordinate a response. 3. While some areas of Afghanistan do not have OCC-Ds other regions, such as RC Southwest, have an increased need for OCC-Ds " . . . due to the fact that most of the districts have multiple ANSF elements operating in the same general areas, as well as many of the districts being comparable in size to provinces in other regions". 5. OCC Foundations Course. Each of the regional OCCs have varied methods of training the staffs of the OCC-R and its respective OCC-Ps. The OCC-R in the 201st ANA Corps had developed in 2013 a four-week long course that taught the basic staff procedures needed to effectively run an OCC. The course was set up and taught by trainers of the U.S. military located at FOB Gamberi but eventually the responsibility of the instruction was turned over to members of the Afghan OCC-R.
Communications Hub. The OCCs at district, provincial, and regional level rely on good communications up and down the OCC system as well as with the headquarters of the various ANSF entities. The preferred method of communications is encrypted radio traffic. Both the MoD and MoI have deployed computer systems to use the Internet to allow for file transfer and email. 7. In addition phones and faxes are in use. However, it is common practice for staff and commanders to communicate using their cell phones. (Photo to right is an ANA officer in the Wardak province OCC-P. Photo by SPC Jaime DeLeon, Task Force Spartan, June 2009). Communications Hub. The OCCs at district, provincial, and regional rely on good communications up and down the OCC chain as well as with the headquarters of the varioius ANSF entities. "The creation of Operations Coordination Centers represented an attempt to give the ANSF a common operating picture (COP) and facilitate information sharing between the ANA, ANP, and National Directorate of Security (NDS). Development of these coordination centers was a complex and at times apparently convoluted effort to join disparate stove-piped personnel, logistics, and administrative systems - challenges that continued to make the OCC concept of operations a work in progress. Without a joint-manning document, single logistics support, and a discrete budget and authority to procure equipment and supplies, the OCCs could remain ineffective, providing inconsistent performance across Afghanistan". 2. Resemblence to FEMA. There is no organization within the U.S. military that resembles an OCC. This poses a unique challenge to U.S. military advisors as there is no frame of reference to associate the Afghan OCC with. The closest organization could be the regionally-based Federal Emergency Management Agency organizations. 6. October 31, 2014. "Afghan 119 police services prevent violence". Central Asia Online. September 19, 2014. "SFAAT 3 encourages teamwork by improving the ANSF common operating picture". DVIDS. Easy to use mapping software provides SA. August 21, 2014. "3rd Cav to advise Afghan security". Fort Hood Sentinel. Members of a 3rd Cavalry Regiment SFAAT are advising the OCC-R in Paktiya province. February 9, 2014. "Coordination centers fortify Afghan security". Army. mil. Information about OCCs and the OCC-R co-located with the 201st ANA Corps. February 4, 2014. "Spartans help Afghan forces forge their future". DVIDS. An SFAAT from 3rd BCT 10th Mountain Division meets with the OCC-R at FOB Lightning. December 16, 2013. "Renovating OCC-P in Zabul province brings Afghan National Security Forces together". DVIDS. December 6, 2013. "Successful mission for Operational Coordination Centre Provincial advisors". Defence News - Australian Department of Defence. Australian advisors from Combined Team Uruzgan (CTU) confirm that the OCC-P of Uruzgan province is ready. November 30, 2013. "Uruzgan OCC-P independent of advisers". DVIDS. September 26, 2013. "The Operations Coordination Centre - Provincial in Tarin Kowt is one of the lesser known success stories of the Afghanistan war". SBS News Australia. August 30, 2013. "We are fighting for the same reason". DVIDS. The OCC-R in North of Kabul area holds a conference on medical treatment for ANSF. July 30, 2013. "Coordination key to Afghan success". DVIDS. The OCC-P in Tarin Kot, Uruzgan province will be key in establishing security after the ISAF departure. July 21, 2013. "A small organization with a very big name". Regional Command East. News release from RC East about the OCC-P in Kunar province. July 9, 2013. "Environmentally Sound". DVIDS. The compound housing the OCC-P in Kandahar is transferred to the Afghan Uniform Police (AUP). July 6, 2013. "Recognize and stay alive". DVIDS. ANSF members at OCC-P Parwan located in Charikar receive counter-IED training from CJTF-Paladin. June 19, 2013. "Operational Coordination Centers bring security to Afghanistan". Fort Hood Herald. The OCC-R in the North of Kabul (NoK) area of Afghanistan coordinates security activities. May 18, 2013. "Regional coordination center synchronizes security forces". Regional Command East. News about OCC-R East at FOB thunder. February 6, 2013. "Afghans leading the way in Laghman province". DVIDS. Members of the OCC-R at FOB Gamberi graduate from an SFAAT led 'Operations Command Center Foundation Course'. December 20, 2012. "SFAAT cultivating Afghan relationships". Army.mil. March 7, 2012. 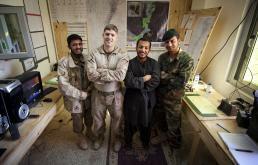 "Making Strides Behind the Scenes: Afghan forces, Marines serve Garmsir from operation coordination center". DVIDS. Garmsir OCC-D.
March 5, 2012. "Zaranj-based Afghan forces expand capabilities, develop skills". I Marine Expeditionary Force. The OCC-P in Nimroz province is operational. October 6, 2011. 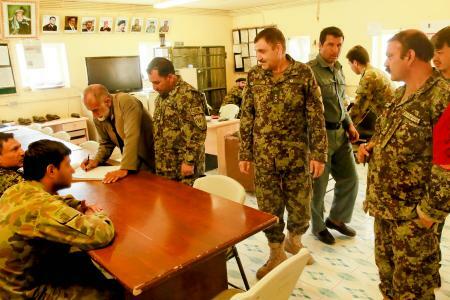 "Soldiers open ANSF operations coordination center in Farah". ISAF News Release. The Pusht Rod District has a newly opened OCC-D.
April 15, 2011. "Joint effort opens Parwan Operations Coordination Center". DVIDS. April 14, 2011. "Soldier Integrates Afghan Operations". DoD News. The story of how a U.S. Army advisor to the Wardak provincial OCC-P does his job. LTC Larry Daley of the Task Force Patriot, 10th Mountain Division. February 25, 2011. "Afghan Ministry of Interior Officials Visit Coordination Center". ISAF. January 1, 2011. "Afghan-led coordination centers take shape". War on Terror Blog. News article about the OCC-P in Ghanzi province. December 12, 2010. "Coordination center disperses life-saving information region wide". Army.mil. Article about OCC-P Kandahar. December 8, 2010. "Ghor Operations Coordination Center Strives for Improvement". ISAF News Release. June 20, 2009. "New joint operation coordination center established in Wardak". ISAF NATO Facebook. Article discusses the opening of the Operation Coordination Center - Province for Wardak province. 1. For more on how intelligence was used to drive operations in the context of operation coordination centers during the Vietnam war see "A Retrospective on Counterinsurgency Operations", by Colonel Andrew R. Finlayson, USMC (Ret.). The author worked for the Phoenix program (a CIA run operation to eliminate the Viet Cong shadow government). Posted on the Central Intelligence Agency website. 2.The quote on the effectiveness of OCCs was taken from Assessment of U.S. Efforts to Develop the Afghan National Security Forces Command, Control, and Coordination System, Report No. DODIG-2013-058, DoD Inspector General Special Plans and Operations, March 22, 2013, page iii. A detailed account of OCCs is provided in the same report on pages 17-18 and 39-41. 3. If an ALP element gets into contact with insurgents and needs assistance (QRF, MEDEVAC, or resupply) they can call back to the OCC-D where a response can be coordinated from the ANA, AUP, or NDS. For an example see "Afghan Local Police: How coordination and determinatioin lead to success", North Iowa Today, January 25, 2013. 4. See Charikar Angered by Security Force Presence, Institute for War & Peace Reporting, March 2, 2010. 5. For the need for OCC-Ds in RC SW see "Lessons from an Afghanistan Advisor Team: After Action Report from the Advisor Team to the Operations Coordination Center - Regional", Marine Corps Center for Lessons Learned, March 2013 Newsletter | Volume 9, Issue 3, page 7. 6. For more about the OCC resemblence to FEMA see "Operational Coordination Centers bring security to Afghanistan", DVIDS, June 10, 2013. 7. 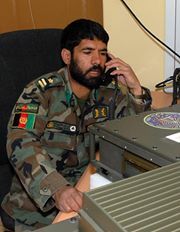 For more on the radio and Internet systems see "Afghan Police Update: February 2009", The Long War Journal, February 26, 2009. This page is available as a Adobe Acrobat PDF file at the link below.